This stunning 3 bed, 2.1 bath home located in established neighborhood of Valley View offers high quality, low maintenance living. The open floor plan invites entertaining for any occasion from casual to elegant and features granite surfaces, SS appliances, hardwood, slate, majestic archways, cedar beams and red oak entry door. Escape to the intimate master suite and spa-like bath or enjoy the tranquility of the private back patio. For more information about this property, please contact Diane M. Grove at 817-337-0000 or info@groveteam.com. You can also text 2954934 to 67299. Maybe you already have your tape measure in hand, ready to tackle a bathroom remodel, open up the floor plan or finally reimagine that unfinished basement. There are plenty of considerations to take into account with any project, including space, budget and your desired results. But you also need to think about preserving the air quality of your Keller home, especially if anyone suffers from allergies or asthma. Shut the door on bad cabinets. If you’re looking to add or replace your cabinets, you may be considering common options like pressed wood, particleboard or composite boards. These materials, however, often release high levels of volatile organic compounds such as formaldehyde. To make your new cabinets more suitable for the asthma and allergy suffers in your home, talk to manufacturers about low-VOC options instead. Keep the moisture out. Mold and mildew is a common trigger and can make breathing difficult for asthma and allergy sufferers. These hazards grow from excess moisture in your home, which comes in through the doors or windows. New windows offer energy-saving benefits, and updating the weather stripping on your windowsills and doors can reduce the presence of moisture - thus reducing mold and mildew concerns. Get serious about your air. No one appreciates indoor air quality more than allergy and asthma sufferers. An updated heating, ventilation and air conditioning (HVAC) system can improve each breath everyone takes. If you plan to update your home’s HVAC system, opt for one with a replaceable or washable filter—making it easier to control the indoor air quality. This is also a great time to make sure air ducts in your home are unobstructed and large enough to circulate air effectively. Find fabulous floors. If you have considered replacing your flooring this year, hardwood floors are very stylish right now. Additionally, wood floors are also more asthma and allergy friendly than wall-to-wall carpet. Cover your new hardwood floors with small, washable area rugs for a more breathable environment everyone can enjoy. And for those rooms where carpeting still exists, remember to vacuum the space weekly and clean up any spills immediately. 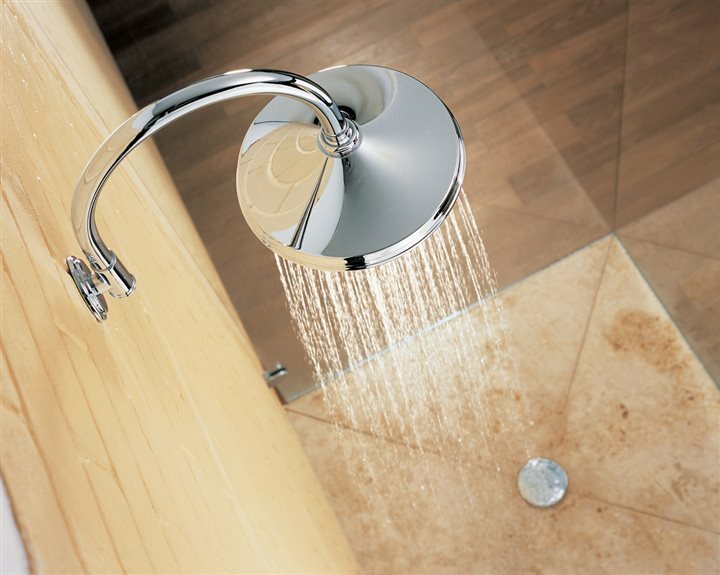 Waterproof your home. Leaky pipes, water in the basement or even on the walls - moisture like this can be a source of mildew, as well as indicate a general waste of money and potential cause of greater damage. 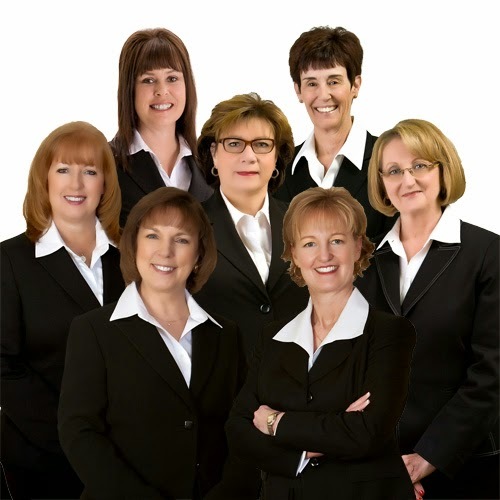 These issues should be addressed immediately before water damages your home or mold and mildew become a serious problem. The right home project not only benefits the home itself but all of the people who live in it, including anyone with asthma and allergies. Before you start your project, consider what you can do to preserve your Keller home's air quality. Doing so will have everyone breathing more easily and loving your home even more. Knowing more means paying less when roofing your Keller home. Shopping for roof shingles can be confusing. But knowing the 3 C’s of buying a new roof – Cut, Color and Coverage - can help Keller homeowners choose the best roof for their home and make the entire process easier and less expensive. Cut refers to the shape of the shingle and can have a huge impact on a roof’s appearance. 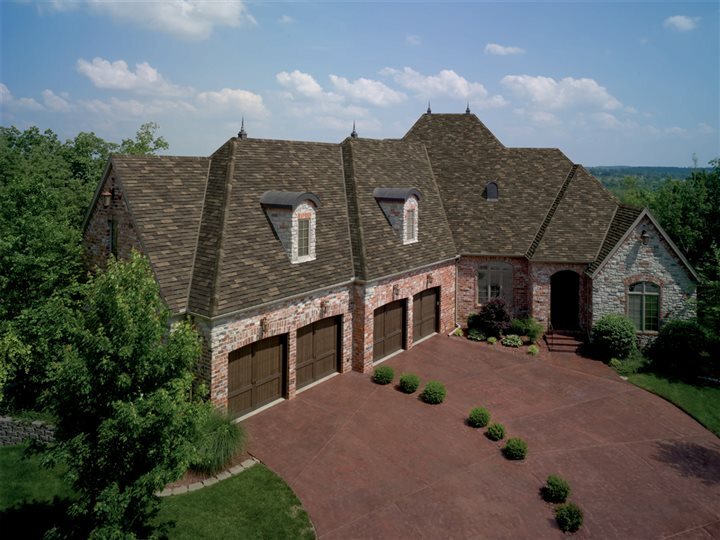 Depending on the cut, specialty laminated asphalt shingles can give the illusion of wood shake shingles. Other options can resemble stone, slate or tile. Shingle cut can also give a modern or vintage look to a home, so it’s important to choose a cut that fits the style of the rest of your house. The shingle cut can also affect the installation speed and the cost of your roof. Shingle application methods can help speed installation and reduce waste. When you think of shingle color, you probably think brown, gray and black. 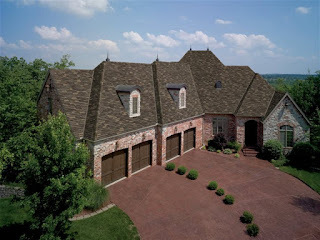 And while those traditional colors are still very popular, in recent years asphalt shingles have been introduced in a wide variety of colorful hues. Color trends include high-contrast options like Rustic Evergreen and Glacier White, as well as a popular move toward natural colors emulating the vibrant tones found in nature. When choosing a color, take into account the exterior color of your home, including siding, shutters, porch and front door. If the lots are close together, also consider the colors of the exteriors and roofs of the homes on either side of yours. Some options include contrasting colors, complementary colors or analogous color schemes. It’s important to understand the warranty on your roofing system. Coverage includes which items are under warranty, under what circumstances the roof is warranted and for what amount of time. Most roof warranties don’t guarantee your roof will last 30-50 years, but do provide options if you experience a manufacturing defect during the warranted time frame. Look for a warranty with longer “upfront” coverage, as these typically offer more time during which both materials AND labor to install replacement shingles would be covered (tear off, removal and disposal is typically not covered). Manufacturers’ warranties don’t cover regular wear and tear of your roof and weather damage is also not typically covered by manufacturers, which is where your home insurance comes into play. Also, many times problems with a roof are the result of improper installation, so make sure to choose a reputable local roofing contractor, preferably a preferred installer who has received training from the company that manufactured the shingles. Also, ask whether your contractor offers a separate warranty for the installation of the product and for what period of time. Understanding these three C’s of roofing can help you buy a “gem” of a roof for your Keller home and hopefully save time and money. When you look out the window into your yard, what do you see? Is it an inviting space that encourages you to get out and enjoy the fresh air? Or could it use a bit of sprucing up? This is an opportunity to upgrade and get the most out of your outdoor space. With only a few features, you can create a leisurely outdoor space fit for relaxation and escape from everyday stressors. These backyard additions can bring both functionality and beauty to your Keller home’s exterior. Pumped up curb appeal. Curb appeal can make or break the appearance of your home. Step out to the street and take a look at your home from a passerby’s view. What stands out? Consider adding a fresh shade of paint to your front door. Plant a few colorful flowers in window boxes or pots for some eye-catching detail. Outdoor lighting. Another way to add curb appeal is to illuminate your home with outdoor lighting. Strategically place lights throughout your yard to add a welcoming theme to the look of your home. Outdoor lighting also provides a number of safety features. Not only does it deter burglars and vandals, but it makes your pathways and sidewalks easier to see so you can have added peace of mind. Fire pit. Whether it’s built-in or portable, a fire pit can work wonders on a backyard’s ambiance. Not to mention it will become increasingly useful as summer transitions to autumn. Imagine warming up during those breezy nights around the fire with your family and friends. This simple addition instantly transforms your patio into an inviting gathering space and allows you to entertain long after the sun goes down. You can already taste the roasted marshmallows. Updated gates. Fences and gates are great for keeping kids and pets out of places they shouldn’t be like pools, gardens and other potentially dangerous areas. 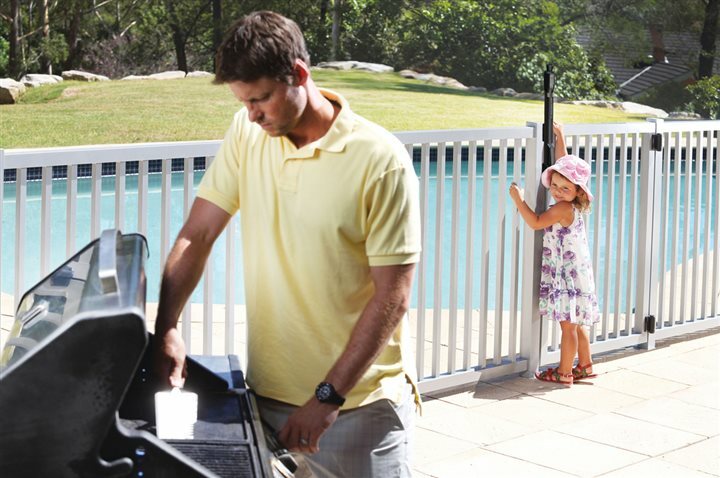 When updating your outdoor space this summer, a safer gate latch could prove beneficial. Keep your gated areas safe with an alarm that sounds if someone is getting into an area they shouldn’t. You can install a latch gate in minutes without the need for special tools, screws or wiring. It’s essentially two projects in one: a reliable gate latch and alarm. Outdoor kitchen. Summer is the perfect time to enjoy meals outside with your family and friends. Why not take the cooking outside too? This way, you’ll be able to socialize with your guests while preparing a delicious barbecue meal for them. An outdoor kitchen can be as simple or as complex as you’d like. Start with a grill and work your way into outdoor refrigerators, sinks and serving areas. Summertime shouldn’t be spent sitting indoors. Studies show that spending time in the sun increases your vitamin D levels, which helps fight certain conditions like depression, osteoporosis and heart attacks, according to Harvard Health Publications. Keller homeowners can make their outdoor time more enjoyable this summer with these outdoor living additions. You will love this well maintained 4 bed, 2 bath home in The Ranches East. Gorgeous kitchen features granite surfaces and an abundance of cabinets. The majestic archways from breakfast area lead into family room. Spacious secondary bedrooms allow for overnight guests. The combined formal dining and living area was created for congeniality and perfect for entertaining. Enjoy a BBQ on patio while the kids romp in the grass. Easy access to 170,35W and 114. For more information about this property, please contact Diane M. Grove at 817-337-0000 or info@groveteam.com. You can also text 2907692 to 67299. Fabulous 3 bedroom, 2 bath well maintained home close to shopping, restaurants and highways. Spacious family room with fireplace overlooking backyard. Light and bright kitchen boasts island, breakfast bar and ample storage. Escape to the large master suite and relax in the garden tub. Large secondary bedrooms plus a study. Awesome yard allows plenty of room for family fun and entertaining under the covered patio. For more information about this property, please contact Diane M. Grove at 817-337-0000 or info@groveteam.com. You can also text 2901738 to 67299. You will love this 3 bed, 2.5 bath home in established North Fort Worth neighborhood. A warm and welcoming family room to entertain your guests while cooking a feast in the efficiently designed kitchen with ample storage and counter space. The combined formal dining and living area was created for congeniality or enjoy you morning coffee in sunlit breakfast room overlooking a picturesque back yard. Easy access to 35 and highly desired Keller ISD! For more information about this property, please contact Diane M. Grove at 817-337-0000 or info@groveteam.com. You can also text 2891913 to 67299. Sunny summer months are the perfect time for a colorful refresh of your Keller home. With open windows, warm weather and the tips below, you can check painting off your list in a breeze and head back outdoors to enjoy the weather. When it comes to paint, quality matters. Search for a combination paint-and-primer to save a few steps and ensure complete coverage. Good options have high hiding ability and resist dirt and scuffs. Durable paint usually provides a one-coat guarantee and many brands can be tinted to both classic and contemporary hues. With quality paint, you can spend less time painting and more time on the lake, in the yard or with your friends and family. Once you’ve chosen your product, it’s time to pick a color. Color selection can seem intimidating, but it's a chance to infuse your personality into your home. Many online resources are available for Keller homeowners to explore, coordinate and experiment with different looks. Pinterest, Houzz and Apartment Therapy are great websites for browsing images, finding home décor inspiration and colors that speak to you. The most realistic way to envision the color in your home is to see it in action. Many paint retailers offer small sample cans for just a few dollars. Use these to paint a few stripes of each color option in the room you’ll be painting, then watch as the color changes in different lighting conditions. Sunlight, shadows and furniture can all alter the appearance of paint in your home. Before fully committing to a hue, make sure it’s one you’ll love in the morning, afternoon and night. High-quality painting tools save you time over the course of your project and produce the most beautiful finish. For best results, use a high quality, lint-free roller cover. Select brushes made of nylon and polyester and for flawless edges, use a painter’s tape specifically designed for your surface type. Proper preparation is the key to achieving long-lasting color. Begin by removing all the wall fixtures you can such as pictures, doors and light switches. If you have small cracks or holes in your walls, remove any dust and apply a patching material. Make sure to allow this to dry completely before sanding the finished area. Wash away oil, grease or wax stains by dampening the surface, applying mild detergent with a sponge and then rinse the wall clean. Once dried, you’ll be ready for smooth application and beautiful color. With these five tips and a free afternoon, you can easily refresh the inside of your Keller home into a colorful oasis this summer.